In the video you saw me stamp out the Caffeinated Flamingo and use her for my focal point. I also used the back of the Caffeinated Crab for the island on my ink blended background. I used Copic markers to color the flamingo, as well as the tropical die cut pieces used to build the scene. I like the vibrant colors and blendability I get with them. Both “pull” and the flamingo were stamped with Memento Tuxedo Black ink because it it Copic safe. To emboss my sentiment, I prepped the strip with an anti-static powder tool, inked the stamp with Versamark, and sprinkled on white embossing powder before heating it. My card front was cut out with a stitched rectangle die and I added a thumb notch to it, as well as the A2 card base, with a stitched circle die. I cut the pull tab and sentiment strip with stitched strip dies and I used a clear piece of acetate to make the second part of the lever. 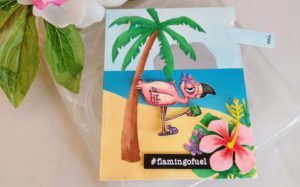 My ScanNCut is my favorite tool for fussy cutting, but before I could cut out the flamingo and arm, I needed to make sure I prepped my images by adding lines with a Copic Liner (0.3) and whiting out unwanted areas with a Posca pen. To attach the lever pieces together, I used mini brads. You can make thin fasteners from paper, but brads are fast and easier. In order to accommodate the thickness of the brads, I popped my card front and flamingo body up with foam tape. My glue of choice for attaching paper to paper is PVA in a Fineline bottle and I use Super Tape to attach acetate to anything else. 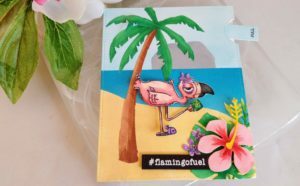 To add shimmer and shine to my card, I used an Aqua Shimmer pen on the flamingo, Stickles on the flowers and mug, and Diamond Glaze on her eye. So what do you think of her? Do you have any stamps in your stash you can add motion to? 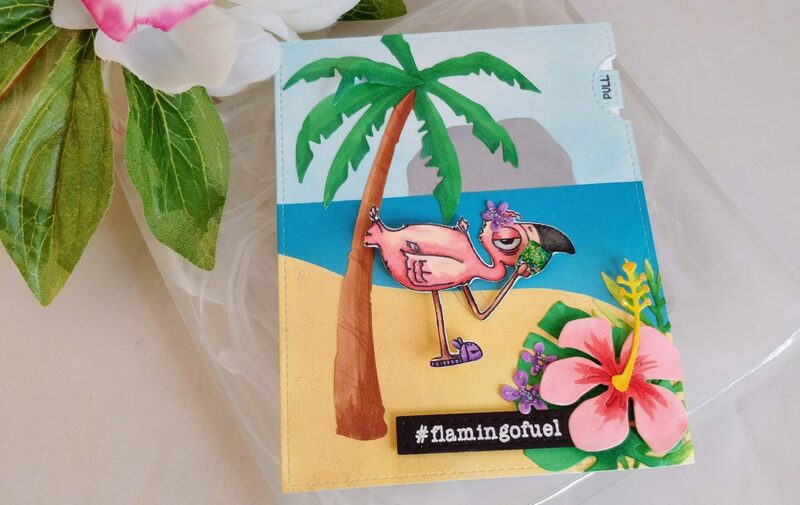 If you’d like to pick up the Caffeinated Flamingo, be sure to head over to therabbitholedesigns.com. 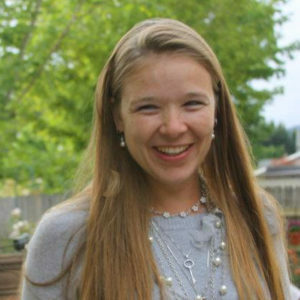 And don’t forget to check out their blog, where I’m featured! If you’d like to see more interactive cards, you might want to check out this article. Until next time my friend, stay crafty! This site uses affiliate links whenever possible, but only for products I use and love. Thats cool the lever to make the coffee go up and down…digging the slipper LOL!